TRY_PARSE is one of the new built-in conversion function introduced as a Part of Sql Server 2012. TRY_PARSE function is Similar to PARSE function, but if PARSE function fails to convert the value throws an exception where as TRY_PARSE function returns a NULL value. Important Note: TRY_PARSE function is not a native SQL SERVER function, instead it is a .NET Framework Common Language Run-time dependent function. Then obviously it will have the performance overhead and also requires the presence of .NET CLR on the database Server. Continue to use the existing CAST and CONVERT functions wherever it is possible. string_value : String expression which needs to be parsed. data_type : Output data type, e.g. INT, NUMERIC, DATETIME etc. culture : Optional string that identifies the culture in which string_value is formatted. If it is not specified, then it takes the language of the current session. 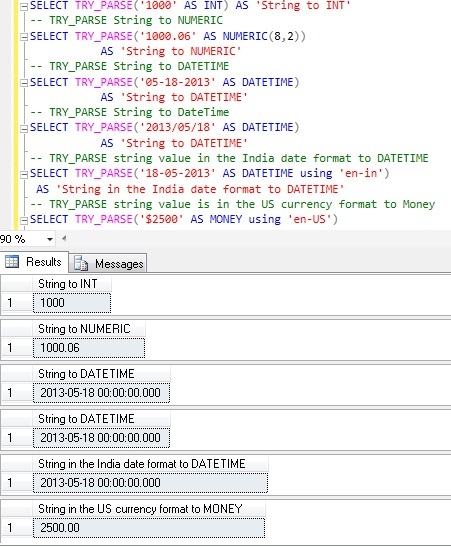 Error converting string value ‘Basavaraj’ into data type datetime using culture ”.